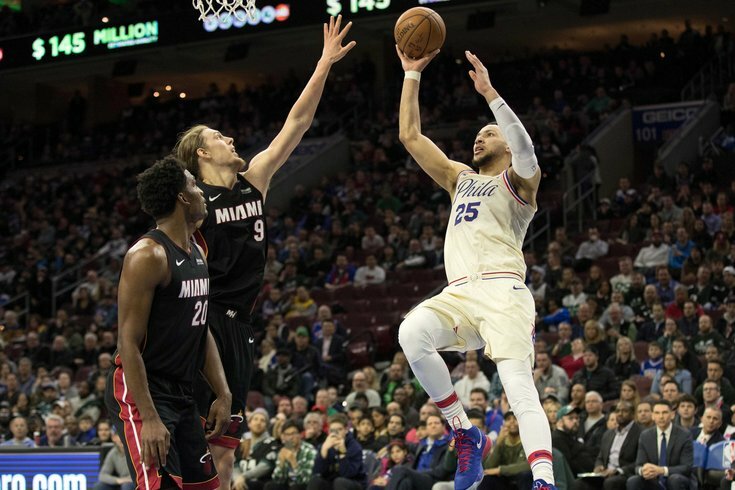 Philadelphia 76ers guard Ben Simmons shoots against Miami Heat center Kelly Olynyk during the second half at Wells Fargo Center. The Philadelphia 76ers enter the 2018 NBA playoffs riding a franchise-best 16-game winning streak. They are hotter than the Miami Heat by definition — and that's saying something. With Joel Embiid still recovering from his orbital bone fracture, the Sixers are likely to be less than full strength heading into Saturday night's series opener at the Wells Fargo Center. Missing that kind of two-way presence is a concern, but rookie Ben Simmons, sharpshooter J.J. Redick and the rest of the Sixers' vastly improved roster have held their ground impressively in Embiid's absence. In the regular season, the Sixers and Heat split their four games, each taking two wins on their respective home courts. Outside of returning veteran Dwyane Wade, Miami's roster, led by Hassan Whiteside and Josh Richardson, is about as thin on playoff experience as the Sixers. There's no doubt Philadelphia holds an edge in the series, capping its first 50-win season (52-30) since Allen Iverson led the Sixers all the way to the Finals in 2001.This time around, the Sixers will look harness the local energy fueled by the Eagles' Super Bowl victory and another NCAA championship for the Villanova Wildcats. A hype video promoting the team's playoff push suggests something special may be in the works. Here's what you'll need to know for the Sixers-Heat series in the first round of the Eastern Conference playoffs. Philadelphia's late-season push vaulted them into third in the Eastern Conference, and has inspired much greater confidence among bookmakers in Las Vegas. According to Bovada, the Sixers are currently the fifth most likely team (+1500, or 15/1 odds) to win the NBA Finals. Out of this year's field of 16, only the Warriors (+135 or 7/5), the Rockets (+160 or 8/5), Cavaliers (+650 or 13/2) and Raptors (+850 or 17/2) are given a better shot at capturing the title. To recap, that's the defending NBA champions, the No. 1 seed in the West, the defending Eastern Conference champs, and the East's No. 1 seed ... and then the Sixers. In the Eastern Conference, Bovada has the Sixers at +500, a considerable distance behind the Cavaliers (+125) and Raptors (+155). Against the Heat, meanwhile, the Sixers are the clear favorite, and will be giving Dwyane Wade and Co. a healthy 6.5 points in Game 1 of the their opening-round series. Odds are only one part of the equation when it comes to evaluating this year's playoff bracket. Many league observers see the Sixers making more than just a little noise this year. Don't be fooled by the youth of Philadelphia's most eye-catching contributors. This team is already a contender, while the Heat aren't. Since the start of February, the Sixers have gone 11-3 in clutch situations (score within five points with five minutes to play), and have posted an offensive rating of 127.7 points per 100 possessions in that span. They’ve allowed 90.4 points per 100 possessions for a net rating of plus-37.3. In that same span, the Heat have gone 7-12 in clutch situations. If these games get tight, the Sixers are a good bet. The Heat should be able to chew clock and play enough defense to slow the Sixers down in this series, but they don’t have the firepower to pull out victories late in games. The Heat is the team so easy to underestimate and look past — so dangerous when that happens. Experience matters in an NBA postseason. Coaching matters. And there is something to the idea of dues-paying and learning to win at this higher level, of stumbling before you soar. Truth be told, these Sixers are a little ahead of schedule -- the playoffs were a legit goal ... but the No. 3 seed? This roster and coaching staff will be learning on the postseason fly. Truth be told, this Miami team isn’t as good as the group that finished the second half of last season with a 30-11 mark. But the Heat’s success was ground out this time around, and that style should make this a fairly lengthy, exhausting series. Sixers fans have every reason to be confident about the team's chances heading into the playoffs. It's not just a matter of nostalgia for those scrappy Iverson-era squads. Brett Brown's team plays hard on both ends of the court and the chemistry in the locker room, after years of watching The Process unfold, may be among the strongest forces in the NBA. We'll leave you with one more hype video.